Talk Nerdy To Me: Go Team Thompson...it's a girl! 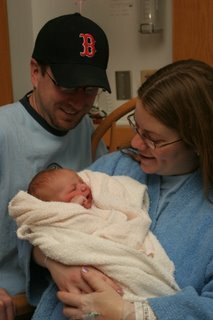 Annika Margaret Thompson was born at 2:27 am after 28 hours of labour. She is a healthy 7 lbs 11 oz. The name Margaret comes from both our mom (Greta) and Kris' (Marjorie). I got to be there for 3 hours of it...from the 3cm to the 8cm part so I feel quite educated:) All are doing well (and extremely tired).